NEWPORT NEWS, Va., Dec. 6, 2013 (GLOBE NEWSWIRE) -- Huntington Ingalls Industries (NYSE:HII) announced today that its Newport News Shipbuilding (NNS) division has officially opened its new Apprentice School, located at 3101 Washington Ave. in downtown Newport News. Apprentices, faculty and staff were joined today by Virginia Gov. Bob McDonnell, U.S. Reps. Bobby Scott and Rob Wittman, Virginia Delegate Chris Jones, Newport News Mayor McKinley Price, HII President and CEO Mike Petters, NNS President Matt Mulherin, Armada Hoffler Holding Co. President and CEO Lou Haddad, and other business and community leaders at the front doors of the school for a celebratory event. A 13-foot tall bronze sculpture cast by Eastern Shore artist David H. Turner was also unveiled at the school's entrance. "What people ask me about more than almost anything else—besides maybe money and infrastructure—is: What are you going to do to sustain our workforce long-term?" Gov. McDonnell said. "This Apprentice School is really a great testament and a model for how to do it right, and community colleges and others around the state are beginning to see what's happened here and use some of the fine programs here as a model for how to do vocational and career and technical training." The 90,000-square foot building triples the school's instructional space with facilities that include eight computer labs, two video teleconferencing classrooms, a physics lab and a 600-seat gymnasium. The school currently accommodates about 850 apprentices and provides office and workspace for faculty, adjunct faculty and staff. "While this facility looks mighty impressive from the outside, it's what will take place inside that is most remarkable," Mulherin said. "It's the people—the students, the faculty, craft instructors and staff—who will bring it to life. They will charter a new and exciting course while honoring the traditions and shipbuilders who came before them." NNS partnered with Armada Hoffler, the City of Newport News and the Commonwealth of Virginia on the project, which includes the school, workforce housing, retail space and a parking garage. "Investing in downtown Newport News was certainly the right decision for us," Haddad said, "and we look forward to working with the city and Huntington Ingalls in the operation of these facilities and making further investments in order to fulfill our quest of transforming downtown into a vibrant place to live, work and play." 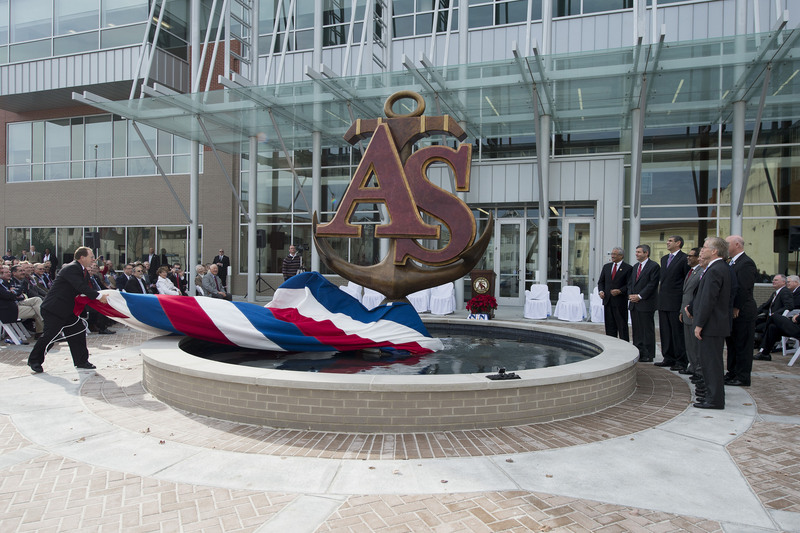 Mayor Price added: "To the leadership of Huntington Ingalls, Newport News Shipbuilding, The Apprentice School and all of its students, faculty and alumni: Congratulations. This is a proud day for you, and we appreciate all you are doing to continue to train the next generation of those who will build good ships, and for making Newport News a place where great things are happening in advanced manufacturing and education." The Apprentice School accepts about 250 apprentices per year. The school offers four- to 8-year, tuition-free apprenticeships in 19 trades and eight optional advanced programs. Apprentices work a regular 40-hour week and are paid for all work, including time spent in academic classes. Through partnerships with Thomas Nelson Community College and Tidewater Community College, The Apprentice School's academic program provides the opportunity to earn associate degrees in business administration, engineering and engineering technology. "I think it's fitting that The Apprentice School stands a short block from Huntington Avenue, which is also named after HII namesake Collis P. Huntington," Petters said. "Huntington's intention was to create not only a shipyard, but, as he said, 'an industry which should be a continuing benefit to the people of Virginia.' We are proud that Huntington's vision is as much a reality today as it ever was, and we are proud that HII's most important products are not ships, but the workforce that builds them."